The muzzle flash issue, highlighted in the screen shot I linked to was a PC problem on ATi cards only. What? No! I have GTX 280 and I get this. And the area it was taken in isn't even as dark as it gets in this game. Well then, it must have been a calculated decision to make it the exact size it is in my screenshot, for it is different in the marine trainer and every other trailer ever made. Do note that the video is also with the pulse rifle shooting in an ever darker area than my screenshot. Whats with the soundbugs and the tearing on the ps3?Are you still working on it rebellion? And whats with the problem when the host is leaving the game?Do you fix it like MW2 with a new host automatic? 1. why havent the issues with matchmaking in the 360 version been addressed? ive seen multiple complaints about many waiting longer than 15 minutes to get into a ranked match on various forums, surely rebellion and sega are aware of these problems, can we get a little reassurance these problems will be fixed for the 360? other than that im enjoying this game in the single player but will move on to multiplayer when you patch it. first thing i would like to ask is when i saw the first look at the MP skins on the forums i saw the warrior dome model was the dog alien from alien 3 was that fake or was it removed? 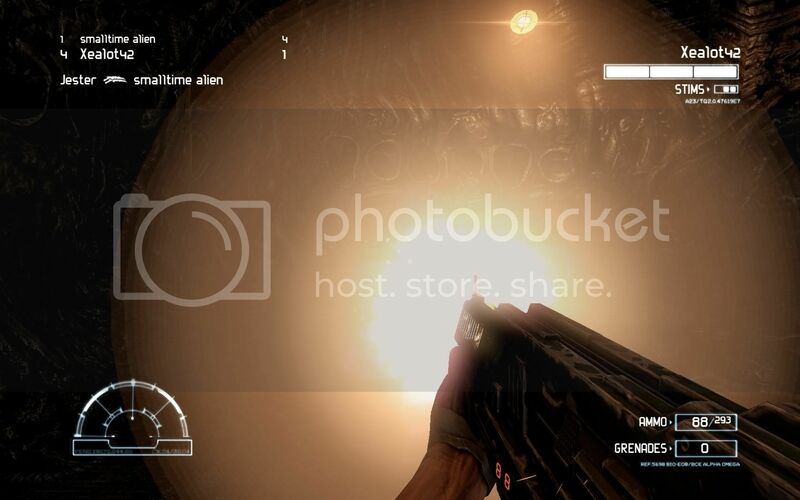 Also will there be a mode of gameplay put in the game like Evac from avp2? I had hours of fun on that and i think it would fit well in multiplayer and make many people happy. "Gee would you sir, id like that"
Only 1 question from me. This might have been asked before, but. 1. Are we going to be able to join a session in progress? Or do we all need to be in the lobby then start? I am referring to the PC version. Have you been keeping up do date with the discussion on SEGA's Alien forums? And why no posts in general threads from Rebellion over there? What is being done to fix the Predator's balancing issue? Everyone one the forums at Sega is complaining about it. As it stands, Predators are overpowered because they are better than Aliens at melee combat plus they get ranged weapons which are one-hit kills with tracking! It's not fair in the Alien vs Predator dynamic, because Predators have so much health that they can withstand two heavy attacks. Also, Aliens are knocked down when: they are countered, the Predator focus lunges from a distance, they are shot by the plasma caster, while Predators cannot be knocked down, and therefore can recover from an Alien counter attack. All other inter-species counter scenarios involve death, besides the Alien vs Predator scenario. It's just too easy for a Predator to hit an Alien in some way and it's game over because they get knocked down. And then Predators weapons make virtually no use of energy. It would be one thing if Predators were in some way dependent on their weapons because their melee abilities were weaker than the Aliens, but the Predators have an advantage in melee AND they can spam discs and spears with infinite ammo! They also sprint pretty damn fast too. Why is it that the Predator is basically an Alien with more health, ranged weapons, and cannot be knocked down? And finally, what about console patches? I realize XBL certification adds two weeks minimum, but they are coming, right? Can you confirm whether there are rank increase rewards for completing single player campaigns and/or collecting all collectables? I thought there were, but some people think it's a bug. If so, how mych XP/rank increase is there for each thing? I have a question, why are there so many PR spawns around the map when you spawn with 99/297? i just have a couple of questions that i hope you can answer, just so you know im a ps3 user, so I'm relating to to the console versions. Ok first question when will the extra multiplayer maps come out? i heard it would be a map a week starting from release so when the ps3 store updated and there wasn't one i was a bit downhearted. Second question is actually a two parter which I'm sure you get lots of questions regarding, but i have waited and thought id see if i could get a more up to date response, will you be increasing the flamethrower damage? as it just doesn't handle right and is a weak aspect of the game, also will it show up on predators vision as a heat source for a more realistic appearance? i like the idea of spraying the walls and lighting them up, all though even this aspect needs work as the flames do little damage or little to stop enemies just walking through knowing the attributes of the fire does little in terms of damage or them even getting alight. I do not know if it has already been asked, but could it be possible to get each ranks requirements (XP) and each rank needed to unlock skins (along with the skin it unlocks). Are you definitely playing in ranked matches? Because I recently saw another post that someone had tested and found you do still get the XP you'd accumulated so far if the host leaves. Would be great if REB could confirm this though, yay or nay?